Paris: Charles Carrington, 1910. First Illustrated Edition. Hard Cover. Very Good binding. 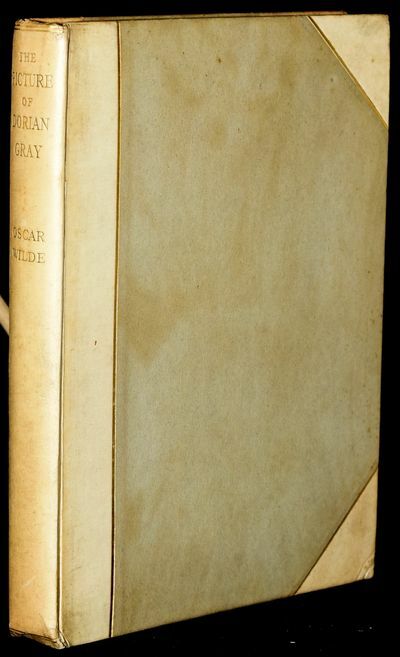 With the stubbed in publisher's errata slip: "First Illustrated Edition of The 'Picture of Dorian Gray'. This illustrated edition was intended to be issued in 1908, the date given on the title page; but, after the text had been printed, the Artist unfortunately fell ill, and this is the reason why the book has not appeared before the present year, 1910. The Publisher". With frontispiece and six additional engravings, all with captioned tissue guards. In half-paper vellum over paper-covered boards, titled in gold at the spine; top edge gilt. The boards with minor discoloration. There is an attractive bookplate on the pastedown, and a previous owner's lovely signature with a small comic drawing in the corner of the endpaper, but overall a clean and attractive copy. Very Good binding.